Jordan sent us a photo of a 1970's era sofa that she wanted to keep in the family. Apart from the very dated fabric and murky wood tones, the cushions had turned into crunchy fossils. The padding exuded dust and a lingering scent of old furniture. Not at all suitable in her decorating plan! After chatting about a ballpark estimate to completely reupholster the sofa, she sent us a photo of two fireside chairs that ... uhm ... shared the same styling. I was amazed that someone managed to tuft that heavy, nubby fabric in so small an area! And the orange - who doesn't associate that color with that era? Nostalgia aside, the chairs sifted dust onto the floor when touched too hard. Making them usable - and desirable - meant starting at the empty frames just like the couch. At first Jordan thought she wanted to keep the original color of the wood frames and to refresh the finish with touch-up and a new coat of lacquer (we call that "over-finishing"). Once we saw her paint scheme in the room, we suggested she consider refinishing with a new paint and glaze style finish that would embellish her color scheme. The dark frames seemed like they would contrast too heavily against the walls - exuding that 1970's aura. We all agreed that making the right color choices for the wood finish would depend on the fabric. After leafing through some fabric sample books, Jordan decided she wanted some color in the room versus a purely neutral tone look. A lighter blue or aqua color with some radiance and a background tone compatible with the wall paint became the goal. She was a bit overwhelmed by the array of possible fabrics. To help her narrow down among the hundreds of choices, we browsed and selected some digital examples from our fabric sources. Presenting them on a simple web page with photo carousels made it easier for her to compare fabric options (see the fabric choice presentations). When she saw virtual samples she liked, we sent her physical sample memos from the fabric houses so she could feel the textures and check the color in the room. A two-fabric scheme emerged throughout the process: one fabric as the anchor and another as accent. 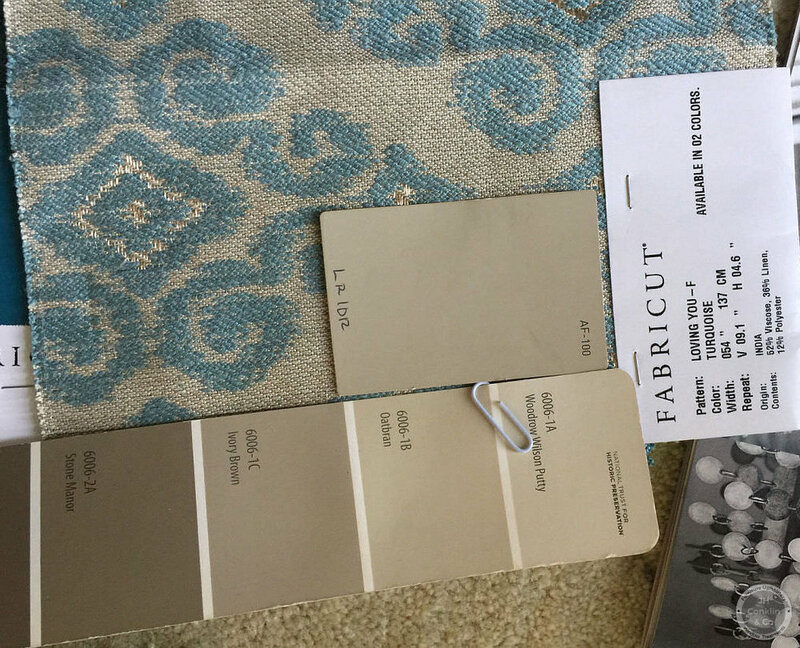 The final selections both came from Fabricut. With the fabric selections complete, the frame color decisions came next. To provide some contrast against the fabric, a base color lighter than the background of the anchor fabric was a good choice. For integration and interest, an accent glaze similar to the wall paint would highlight the carvings and details on the frames. During the decisions process, we had removed all the old upholstery and prepared the frames for the new finish. Here is a shop view of the dusty and tedious upholstery tear-down. The frames then moved into the refinishing area. Several coats of primer sealed the wood and a sand colored lacquer set the base color. A custom mixed glaze set the accent color in the details, providing a layer of interest and depth to offset a 'plain painted' look. Wiping and brushing the glaze created a soft, smokey look. 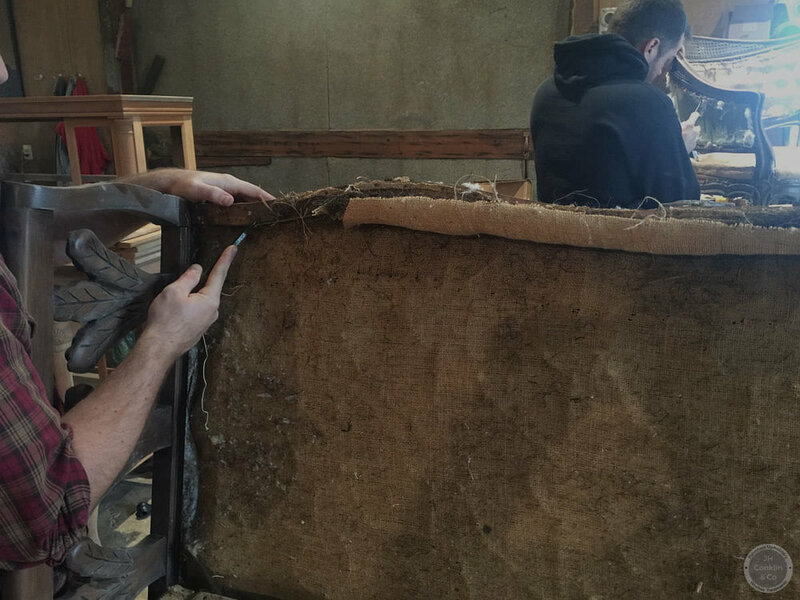 The new upholstery started with rebuilding the foundation with new webbing, burlap, foam and Dacron padding. No dust, no smell. After a careful trip to Moorestown (and through the front door) we placed the furniture in the room. Right away Jordan began to smile and touch the fabric. The anchor fabric background and the frame finish fit right into the theme of the walls and trim. The accent velvet creates a brilliant focal point in the room - lively with frothy color. Large and small pillows covered with one fabric on each side gives some decorating variation. And a few courtesy accent pillows in a third fabric that we just couldn't ignore creates an additional 'pop' potential. Collaborating with Jordan to fulfill her design decisions was a rewarding experience. Upgrading these family pieces to keep them in her home evolved from 'restoration' to 'transformation' throughout the process. She worked her way into creating one-of-a-kind pieces that express her vision wonderfully. 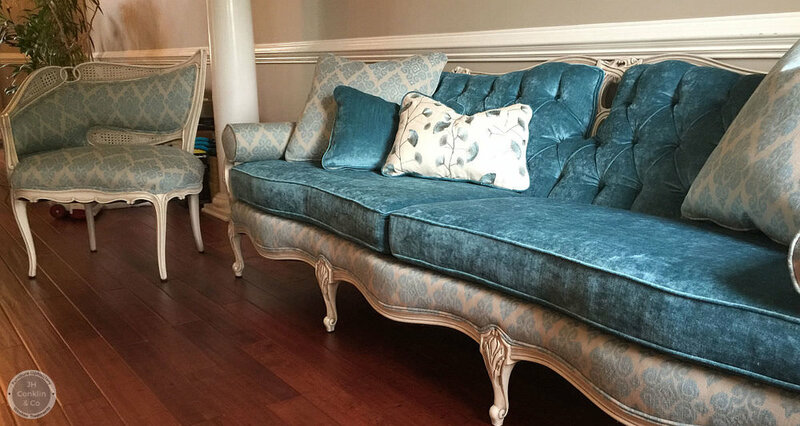 The furniture workshop of JH Conklin & Co. upholsters furniture for people and businesses throughout Southern New Jersey, Delaware, Philadelphia metro and the southern shore areas. Older PostWhy Do Upholstery Shops Charge Cutting Fees? Jordan from Moorestown NJ wanted to keep a family sofa and some chairs from the 1970’s. But they would need a transformation to fit into her more modern design scheme. A complete makeover brought her vision home! Why Do Upholstery Shops Charge Cutting Fees? This question from Joe about a policy from another upholstery shop gets more than the short answer. Answering "why" gets to the heart of upholstery pricing tactics. Helpful when comparing quotes from multiple shops. Church pew cushions re-upholstered in New Jersey. Done in two phases between congregations to avoid disrupting services. Project photos, fabric choice and cost information. A makeover of some favorite furniture for a family moving into a new home in Harvey Cedars, NJ. Refinishing and upholstery get the pieces ready to fit into the design of the new space. Before and after photos. with some details about the fabric. Cracked and torn vinyl top pads on healthcare equipment can be recovered affordably and conveniently. Get information about re-upholstery of damaged exam table covers. With examples, cost information and a video of a great replacement fabric.